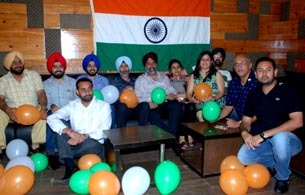 Barinder Saluja, Chandigarh,Aug. 14 : The Alumini of the old students of Guru Nanak Public School, Sector 36, Chandigarh, celebrated the 63rd Independence Day here in Chandigarh by getting together and rejuvenating the essence of true patriotism & brotherhood amongst themselves. The feeling of togetherness, brotherhood, affection & peace was the main idea behind the Independence Get together, where the Old students ranging from 1980 pass-out batch onwards were present to prove the Essence of Patriotism which is still alive in the Hearts of GNPS’iets. Along with Old students, Some Old Teachers also participated in the Get together as a true support of their old students, who in the present days are well known personalities of Chandigarh and are contributing lots of beautiful deeds to the betterment of their City Beautiful. Mr. Vikas Cuccuria, Pali Ranauta, Senior Advocates, Surinder Teja, Organic Farmer, Col. Vipan Cuccuria from Indian Army, Ms. Amrita Kaur,a Kindergarten Teacher, Jassi Toor, Harsimran Singh, Amitinder Singh, Mr. Sukhija, Manveet Johar, Harinder Batth, Pammi Toor our Old Teacher, Gagandeep Baidwan, all perfect in their field of work. Every Heart had that desire to give something in return to their beloved country, by serving the nation, truly & faithfully, through their respective fields of work. Each and every GNPS’iet was very smartly dressed up, showing of that particular mannerism & elegance. They all together danced to the tunes of songs and spread the word of Peace & Go Green.